Dr. Mark Lysyshyn, Medical Health Officer, Vancouver Coastal Health announced on February 24 the launch of a Concussion Awareness and Training Tool for Educators. 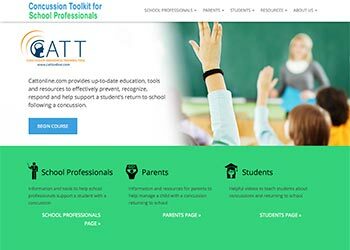 The tool can be found here: http://educators.cattonline.com/ for administrators and teachers. Evidence suggests that children and youth are at greater risk of concussion and more serious head injury than the general population, take longer than adults to recover following a concussion, and that concussions can permanently change the way a child or youth talks, walks, learns, works and interacts with others. BCIRPU has published five new reports for each Health Authority to provide details on the burden of concussion hospitalizations among children and youth. The reports are targeted to health care providers and community stakeholders in the health authority to be used to facilitate discussion of the need for standardized concussion prevention, diagnosis and management specific to children and youth.